All Sports for Schools athletes have represented Great Britain or Ireland at the highest level in various Olympic disciplines. Adam made a dramatic return to International Swimming by winning the men's 100m breaststroke and achieving a further two silver medals at the 2002 Commonwealth Games. He had almost quit the sport 12 months before after suffering with injury. Adam spent ten years at the top of his sport and is now passionate about inspiring the next generation. Adam's motto is: "Success is a choice, not a chance"
Alistair 'AJ' Pingram is a former Royal Marines Engineer. He played professional hockey with the Royal Navy before an accident damaged both his ankles in 2000. He played Point Guard position in the GB Invictus team and plays for Cheshire Phoenix and Rhyl Raptors at homes in Wales. Did you know? AJ attended his first Invictus Games as a spectator before he was encouraged to try out for the team! GB Paralympic football player Alistair has an amazing story to tell. Previously a professional footballer, he survived a life changing car accident in 2006 which left him in a coma for two months. Doctors told him he may never walk again and his football career would be lost forever. Through hard work and perseverance Alistair regained his health before taking up disability football – and scoring against Argentina at London 2012 Paralympic Games! 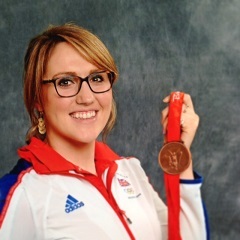 2012 Olympic competitor Amy Smith swam for GB and was a member of the ladies 4x100m relay team. Amy was actually scared of the water until the age of 7 when she was first taught to swim. 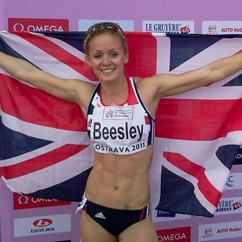 She then went on to qualify for her first international meet in 2006 at the age of 18! 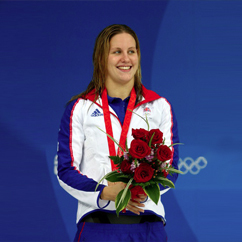 Amy won silver medals in the 2006, 2010 and 2014 Commonwealth Games and silver in the 2010 European Champs for the 4x100m freestyle relay AND she won a GOLD medal as part of the 4x100m medley relay team too! Amy now runs her own Swimming Academy calle 'Swim Swift Elite'. Anna is a Paralympic Wheelchair Basketball Player and competed at the Sydney 2000 Paralympic Games. Anna developed a disability in her teens and discovered Wheelchair Basketball when she was 25 after being a successful Hockey player and coach. Anna had a ten year career playing Wheelchair Basketball with the British Team and she is now a tutor and mentor for the sport. Anna's motto is "anything is possible if you believe it!" Anne Wafula-Strike became the first Wheelchair Racer from Sub-Saharan Africa to compete in Wheelchair Racing at the Paralympics. Upon joining Team GB in 2006, Anne won a bronze in the T54 400m at the Visa Paralympic World Cup. Anne founded the Olympic-Wafula Foundation with a strong vision to promote healthy living solutions for the differently-abled people and those disadvantaged, with a special emphasis on education, mobility, and advocacy to empower and enrich their lives through social inclusion. In 2014, Anne was an awarded an MBE by the Queen of England. Caradh grew up in Sligo, in the Northwest of Ireland. She was really into sport from a young age and started kickboxing after her local football club told her they don’t take girls. to Karate and currently trains in Santry. Caradh aspires to become Karate World Champion and qualify for the 2020 Olympics in Tokyo. Caradh's motto is "always believe in yourself"
Caroline joined the army in 1997 and served tours across the world as part of the Royal Logistics Corps. Caroline is now an Invictus Games competitor and competed in the 2016 Orlando Games in Shotput, Discuss, Swimming, Cycling and Archery. Caroline's motto is "Give 100% and you cannot be disappointed". Cassandra Patten is one of only 9 GB swimming athletes to have won a medal at the Olympics over the last 20 years. She represented Great Britain at the 2008 Olympic Games in Beijing where she won a bronze medal in the 10k open water swimming event. Cassandra is keen to help inspire young people to meet their potential and become fit, healthy and happy. Cassandra's motto is "Tomorrow doesn't have to be just another yesterday". GB Hammer Thrower Chris Bennett took up the sport in 2005 and has catapulted himself into the top rankings, going from strength to strength with a throw of 74.66m at his most recent competition in Loughborough. Chris competed at the 2016 Rio Olympic Games. Did you know that Chris is one of only 5 Scots to ever throw the hammer over 70m?! Christine is an Irish 400m hurdler and grew up in Glenmormley in north Belfast. She was prompted to take up hurdling when she was picked for the cross-country team in P6. Christine is aiming to qualify for the European Championships in 2018. GB Paralympic Fencer and Cyclist, Craig McCann was originally a rowing enthusiast whilst at University! In 2004 he was about to join the RAF but was discovered to have a brain tumour. By 2010 British Disabled Fencing had recognised his amazing potential and that's when his full time training began. Craig represented GB at World and European champs in 2011 and went on to reach the quarter finals in the 2012 London Olympics. Now training for the disciplines of Paracycling (2014 national champion) and Paratriathlon. Craig's motto for life is to 'make every obstacle an opportunity'. Dan is a distance runner specialising in 5k and 10k. In 2015, Dan became English National 10K Road Champion. He's also represented Great Britain at the World Half Marathon Championship and is a 6x England Senior International in Cross-Country/Road. Dan's next goal is to compete in a Commonwealth or Olympic Games for Great Britain. Dan's most important role model is Haile Gebresalassie - "arguably the best every distance runner and always did it with a smile!" 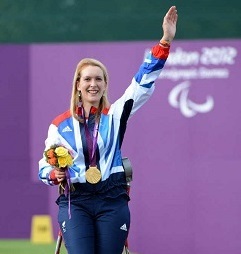 Danielle is a double Paralympic gold medalist in archery and three time World Champion. Danielle currently holds all 12 Paralympic world records and was ranked world number 1 for her entire career. Danielle wants to use her story to inspire others. Daniel's main discipline is Triple Jump, though he competes in other sports too. His PB is 16.31m and he is 4-time National English Schools' medalist. Daniel competed at the 2014 Commonwealth Games, representing his parent's country of origin, Jamaica. Did you know? Daniel started the triple jump when he was 15! Darran is an Invictus Competitor and competed at the 2016 Games in Cycling and Swimming. He sustained spinal, leg and pelvis injuries when he was on active duty in the Army after 26 years of service. His next goal is to be selected for Team GB for the Ironman distance. Darran's motto is, "Dream it, believe it, achieve it"
Darren is a Paralympic Blind Footballer. He was born with normal vision but at 15 months old was diagnosed with a condition which cause him to lose his eyesight. 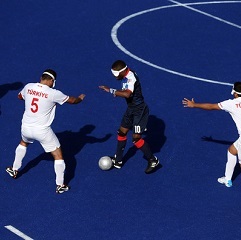 Did you know...Darren is the most decorated blind footballer in British history with 8 medals! David is a decathlete and was inspired to begin competing by his Dad. At age 18 David achieved 7727 points in competition, ranking him No.1 in the world for his age. David's greatest high is coaching his partner to a Commonwealth Bronze Medal in 2014 and his next goal is to become a professional coach, giving back some of the knowledge he has gained over the years. David's motto is "be present in every moment!" 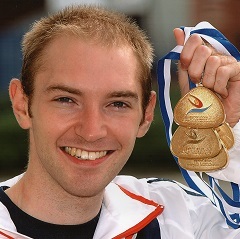 Paralympic swimmer and triathlete David Hill grew up by the sea where he learnt to swim at a young age. Despite being born with no left forearm, David was earning swimming badges by the age of 3! His talent was nurtured until David qualified for the 2004 Paralympic Games. He was world silver medalist in swimming in 2006 and took bronze medals in 2009 in both European and World competitions. In 2012 David took up the triathlon, and has already gained 4th place at the World championships in 2013. David's motto is “there’s no such word as can’t”! Dominick is a GB Gymnast and trains in Birmingham and Lilleshall. 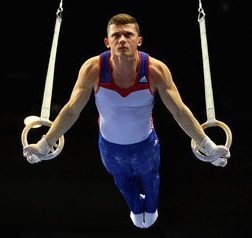 He competed and got through to the finals of the 2017 European Artistic Gymnastics Championships in Romania. Dominick's specialism is the floor but he has won a lot of medals across all of the gymnastics disciplines. Dominick's motto for life is "work hard, dream big!" Born and raised in Essex, Gianni credits one of his school teachers for inspiring him to take up sport. Gianni is a GB hurdler and claimed the silver medal at the European U23 Championships over 110m hurdles. Gianni's top tip for life is to "seize opportunities"! 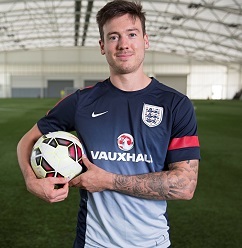 Jack is a GB Paralympic Footballer and is captain of the England Cerebral Palsy team. Jack was due to become a professional footballer until an unprovoked assault led to him suffering brain damage. Jack captained the CP Team at the Paralympic Games in Rio 2016. Jack's motto is "It matters not how many times you fall down, what matters most is how many times you rise"
Jade is a GB Long Jumper and is the Scottish record holder. She has competed at the 2014 Commonwealth Games and 2016 Scottish National Championships. Jade broke the Scottish national women's long jump record almost 40 years after the original record had been made! Olympic swimmer James Kirton represented GB for over 6 years. His events were the 100m and 200m Breaststroke. Through a determination to find his inner strength, James defied injuries to swim his way into the 2008 Olympics in Beijing as well as various other World and European Championships. Recently retired from swimming, James now dedicates his time to working with young people at his swimming club in Sheffield and local schools. James reached his dream of becoming an Olympian through dedication, commitment and a positive attitude. GB Badminton player Jenny was virtually born into the sport! Her mum played for England and her dad was an international badminton coach for 15 years. Jenny travelled the globe playing badminton and became number 5 in the world. Her most recent achievement was winning silver in the 2010 Commonwealth Games in the mixed doubles. "Believe in yourself" says Jenny, and "your attitude is your altitude, it determines how high you fly.". 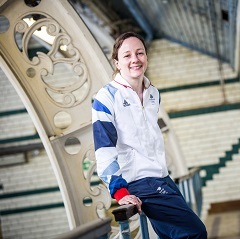 GB Olympic swimmer Joanne specialises in the 200m, 400m and 800m freestyle events. She swam in her first Olympic Games in Athens aged just 17. She has since broken a world record, become Britain’s most successful female swimmer and represented her country at 3 Olympic Games. If she hadn't taken up swimming Joanne says she would have liked to be a teacher. Her advice would be to “enjoy the little things in life, for one day you will look back and realise they were the big things”. Jo is now retired from swimming but has set up a Swimming Academy to inspire the next generation! GB Olympic swimmer Joe was ten times British Champion, double Commonwealth silver medallist, double European medallist and London 2012 Olympic semi-finallist. His events are the 100m and 200m Butterfly and the 200m and 400m Individual Medley. Recently retired from swimming, Joe is now striving for success with his business, 'Swim Swift Elite'. Joe's motto: 'Happy swimmers are fast swimmers. Enjoy what you do'. Jonathan is a Paralympic Footballer and has more than a decade's experience in the sport. He captained the Paralympics GB side on his Games debut at Beijing in 2008 and also competed at the London 2012 and Rio 2016 Games. Jonathan was born with right sided cerebral palsy and has always been motivated to prove any doubters or bullies wrong. Jonathan's motto is "Fail to prepare, prepare to fail." Katrina is a GB para-athlete who was born with cerebral palsy. She says her PE teacher was the person who encouraged her to really pursue her sporting ambitions and she was already competing by age 14. Despite injuring her hamstring during the 2008 Beijing Games, she won gold at the 2010 Commonwealth Games in Delhi and another gold (as well as a bronze!) at the World Championships in New Zealand. A bronze medal was also won at the London 2012 Games in the 4x100m Relay! Katrina's advice to those just starting out in sport is this: “The most important thing is to enjoy it - you’ll excel because of that - but you have to be serious about your involvement to succeed." 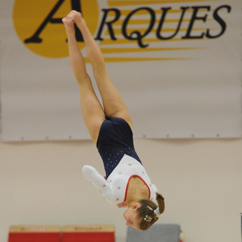 Kelly grew up in the South of England, is now one of the rising stars of British Gymnastics. She is known for her powerful tumbling on the floor, and recently won Gold at the British Championships in the vault. She is also the English floor champion. Kelly says, "don't follow your dreams... chase them!" Kelvin has competed for GB and Ireland as a BMX rider and started when he was just 6 years old! He became World Champion at the 2015 Masters World Championships. Kelvin's motto is "pressure is the shadow of opportunity"
Kristian is an Olympic Gymnast and was part of the British team that famously won Olympic bronze at the London 2012 Olympics. In 2015, Kristian won the European Championship floor gold. Named the captain for Team GB's gymnastics squad for the Olympic Games in Rio, Kristian helped the team finish in 4th place. Kristian's motto is to "dream big!" GB Badminton Player Liz Cann has competed at the European Champs, World Champs and Commonwealth Games. Liz's greatest achievements are winning her medals at the Commonwealth Games. She is now busy inspiring the next generation. Liz's motto is "where the mind goes, the power flows!" Lucy Hall is a GB triathlete who was selected to represent Great Britain at the 2012 Summer Olympics. She was ranked 148th at the time of her selection and was chosen ahead of five British athletes ranked in the world's top 100. She placed 33rd with a final time of 2:04:38 and she had the best swim relay of all. Lucy has won many medals in youth championships and in July 2015, she won the European U23 Triathon Championship. Her next goal is to qualify for the Nice World 70.3 Championships. Lucy's motto is "train hard, be strong, think big!" Luke served in the RAF for 8 years as a Senior Aircraftman. In 1996 he was in a motorbike crash which left him paralysed from the chest down. Luke competed in the 2016 Invictus Games in Orlando and specialises in rowing and hand-cycling. Luke cycled from London to Paris in 2012! The 400m hurdles are Meghan’s speciality. Meghan won a medal in the 4x100m relay at the 2010 Commonwealth Games in Delhi. The things that Meghan is most grateful for in life are the friends, family, grants, scholarships and sponsors that have enabled her to train. 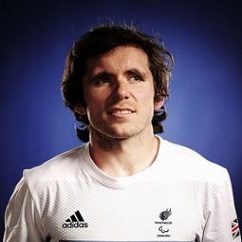 Michael Churm is a GB Paralympic Sprinter and competes in the T37 category. He made the finals in both the T37 100m and 200m finals in the 2008 Paralympic Games in Beijing. Michael's greatest high is winning his Paralympic silver medal and becoming European Champion. Michael's top tip for life is to treat other people how you would like them to treat you. 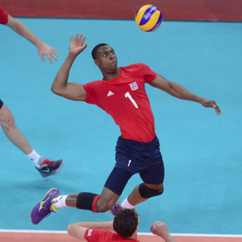 Olympic volleyball player Peter started out as a basketball player then competed at the London 2012 Olympics in Volleyball! Peter made his international debut in 2010 for GB against Denmark and has played much of his volleyball in Holland. After studying animation at Sheffield Hallam University, Peter became involved in script writing and went on to write for Channel 4. He is also a stand-up comic. Rebecca is a GB diver and has competed at both the London 2012 and Rio 2016 Olympic Games. Rebecca won a Gold medal at the 2014 Commonwealth Games in the 3m synchronised diving with Alicia Blagg. Rebecca's top tip is "enjoy your sport"
Rich is a GB Inline Skater who has been rollerblading since he was just 10 years old and qualified as a professional skater by the age of 17. Since 2004 he has traveled around the world competing at the highest level. Rich won a silver medal at the 2011 X-Games and is the European Champion. He is still the number one ranked UK half-pipe inline skater. Did you know that Rich was the second person in the world to ever land a double back flip 180 on a half-pipe?! GB Paralympic Footballer Roy Turnham was originally an 800m runner in the UK Athletics development squad. Roy always loved football and began to play competitively with Everton in the National Blind League in 2008. 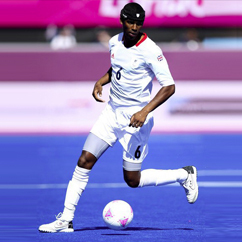 Roy made his Paralympic debut at London 2012 and was part of the Football 5-a-side team that finished in 7th place. Roy has a sister who is also a successful athlete - a Para-cyclist and they both competed at the London 2012 Paralympic Games. Sally is a GB Pole Vaulter and despite a two year struggle with an injury, she won a Bronze medal at the 2014 Commonwealth Games in Glasgow. Sally is able to jump through the top window of a double decker bus!! 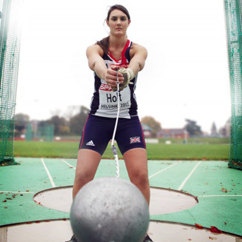 GB Hammer thrower Sarah competed in the World junior championships in Beijing in 2006 and went on to break the UK U23 British record in Germany where she was selected as GB captain. 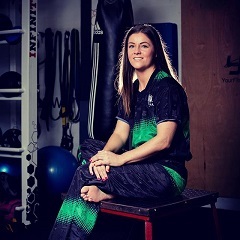 Sarah competed in the 2010 Commonwealth Games and the 2012 European Championships. Sarah has suffered recurring back injuries but with the help of her support team and some strong willed self-management she has not let it hold her back. Born in Middlesborough, Sean now lives in Cambridgeshire. A world class sportsman and adventurer, Sean is a double winter Paralympian as well as a skiing and water skiing champion. A freak ski accident in 2000 broke his back and left him paralysed from the waist down. In 2013 Sean retired from competitive skiing as Britain’s most successful alpine ski racer ever and is now a hugely inspirational motivational speaker. Steve won Scotland's first-ever gymnastics Commonwealth Games gold medal. He has a career which spans over 23 years where he has represented Great Britain at two World Championships at Scotland at five Commonwealth Games. Steve's top tip for life is: Be all you can be. GB Wheelchair Rugby Player Stuart Robinson was a commander for the RAF Regiment Force Protection from 1999 until 2013. It was in 2013 that Stuart was injured in Afghanistan and has since turned to wheelchair rugby, competing in the first Invictus Games in 2014. Stuart is currently working with several UK armed forces charities. He is also the founder of Disabled Discoveries, an online portal helping the disabled community. Tom is a GB Olympic middle distance runner specialising in the 1500m. 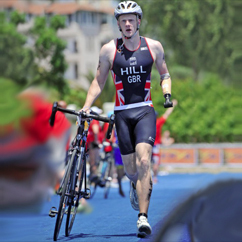 Having represented GB at junior and senior level on the track, Tom has also competed at Olympic, World, Commonwealth and European Championships. In 2010 he not only ran the fastest time for 1500m by a British athlete for 5 years, but also ran the fastest mile time by anyone in Europe! Tom studied exercise science at Florida University and is set to study medicine at Manchester University. Both his parents are doctors. Did you know? Tom is a Manchester United supporter! Former Colour Sergeant Wayne Harrod left the Army in 2011 after a 25 year career. He worked hard with the support of various charities to start a new career as a gardener and now feels the time is right to take on another challenge. 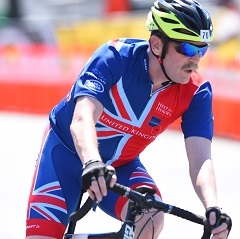 His new passion for cycling led to selection for the Invictus Games 2017 which he feels will continue his recovery journey which started off bleak with no idea what the future entailed to now competing with fellow injured veterans and serving servicemen and women. Wayne's motto is "Keep the faith."